Discussion in 'News - Breaking News & Political Forum' started by Mooney72, Dec 13, 2018. Ninety-five-year-old Lena King, a former U.S. Army corporal, was among the women being recognized for their service as part of the 6888th Central Postal Directory Battalion. There were 855 women in the 6888th Central Postal Directory Battalion. In 1945, the soldiers worked around the clock in Europe, hand-processing millions of letters and packages for the military. That included 7,500 pieces of mail addressed to men with the same name or some with no addresses. 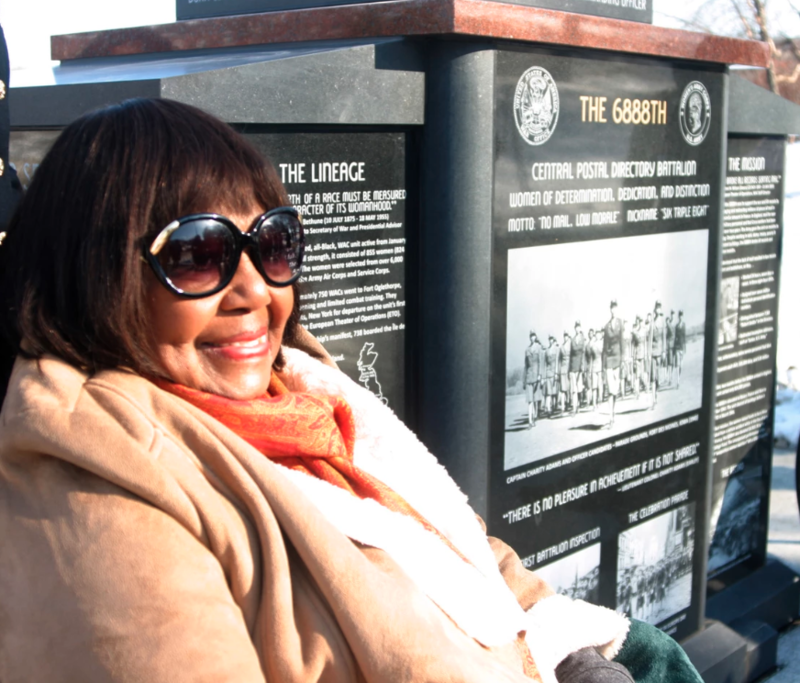 Ninety-five-year-old Lena King from Las Vegas was moved by seeing her name on the monument. King, who was a corporal in the U.S. Army, says the work had to be done. "There was a backlog of two to three years of mail that the servicemen hadn’t gotten," King says, "and of course I realized, being in the service myself, how important it is to your morale to know what’s going on at home, and vice versa." Efforts are underway for recognition at the National African American Museum in Washington, D.C.
Carla Eckels is director of cultural diversity and the host of Soulsations. Follow her on Twitter @Eckels. To contact KMUW News or to send in a news tip, reach us at[email protected]. thefineprint, MzRhonda, Alta Angel and 11 others like this. nysister, lavaflow99, meka72 and 5 others like this. This is an example of 90% of the reason I stay on this site : to continue to learn about incredible gems such as this. thefineprint, kokodiva524, Alta Angel and 16 others like this. Ms. King looks lovely to be 95 years old. How many of the 855 are still living today? Why did it take amlost 70 years for them to be recognized? nysister, aminata, kokodiva524 and 5 others like this. Yes, Ms. King is looking good. I'm glad that she was able to see this after so many years passed. kokodiva524, lavaflow99, meka72 and 3 others like this. OhTall1, nysister, Chicoro and 4 others like this. I never learned this during black history month. I never learned this either. Bumping for black history month. Mooney72 and Chicoro like this. Not enough stories being passed down. Why did it take us so long to honor thses women? @Mooney72 thank you for posting. lavaflow99, Mooney72 and Chicoro like this. This was posted recently by the New York Times. Obituaries of remarkable Black people they overlooked in the past. I can't figure out how to embed it. nysister and nyeredzi like this. Thank you for posting that. I started reading it a few days ago and then forgot about it. I was fascinated by Zelda and Major.